Did you know there are mistletoes native to the Chesapeake area? Mistletoes are flowering plants in the Santalaceae family. Yes, Santalaceae. It seems unlikely, but the family’s name has nothing to do with Kris Kringle. It is derived from the sandalwood genus, Santalum, which is also a member. There are around 1,300 mistletoe species worldwide, and 2 rough groups in North America: American mistletoe and dwarf mistletoe. All mistletoes are hemi-parasitic, meaning they parasitize trees but are not fully dependent on them for all functions. Mistletoes attach to stems of live trees and send root-like structures under the bark to tap the tissues for nutrients and water. Mistletoe leaves are green in color and can complete photosynthesis for energy, but would be unable to survive without the tree. The berries either fall off and colonize stems below or are dispersed by birds. The sticky seeds can adhere to the plumage, feet, or beaks of birds to be scraped off onto new stems while preening, or get eaten to and later deposited on branches in droppings. Bird droppings are the primary way the plants spread; indeed, the word “mistletoe” means “dung on a twig” in Anglo-Saxon. Dwarf mistletoe berries are not spread by birds. Instead, water pressure builds up in the berry cells. Eventually, the pressure builds to a point where the berry explodes, expelling the seed at up to 50 miles per hour, with a range of up to 60 feet! 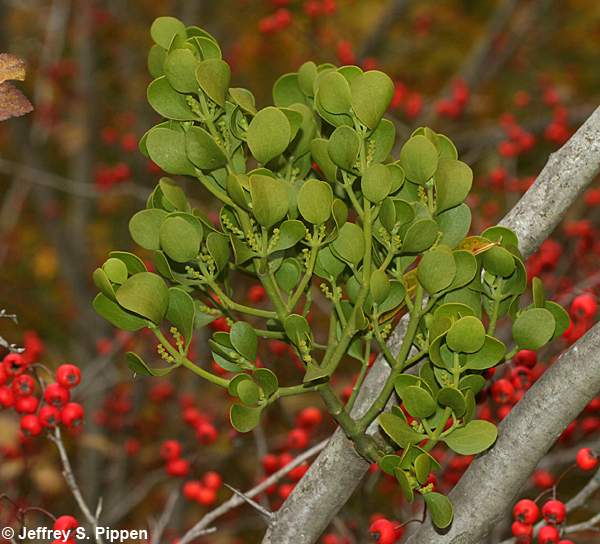 Though we often only think of mistletoe at holiday parties, it plays a significant ecological role in our forests. American mistletoes, while toxic to humans, are important food sources for many forest wildlife species. They bear fruit from late fall through early winter, a time when there isn’t much else for resident wildlife to eat. The berries are an important food for birds and small mammals, and the foliage is eaten by porcupines and larger mammals like deer and elk if they can reach it. Dwarf mistletoes are less important for food but the thick, scruffy, “witches’ brooms” that they create are excellent nesting sites for songbirds, red squirrels, flying squirrels, hawks, and owls. Studies in the western US have shown that a whopping 43% of spotted owls and 64% of Cooper’s hawks build their nests in “witches’ broom” tangles resulting from dwarf mistletoe infections. Oak mistletoe (Phoradendron leucarpum) berries are very important for wintering wildlife. Photo by Mary Keim. Mistletoe is important for many insects too. Their early-blooming flowers are important nectar sources for bees and other pollinators when not much else is available, and many insects only live on mistletoe foliage. Three butterfly species in the US are mistletoe obligates (meaning their caterpillars can only feed on mistletoes), but only one, the great purple hairstreak (Atlides halesus) is found in the Chesapeake Bay Watershed. American mistletoes rarely kill their host tree; their life history strategy is to remain with the host and produce berries as long as possible, so they need their host to survive. Like many of our traditions, appreciation for (and yes, kissing under) mistletoe developed and evolved as societies rose and fell. European mistletoe (of the genus Viscum) closely resembles leafy American mistletoe, so European colonists and subsequent immigrants easily transferred their customs over to North America. As Christianity swept through Europe the old traditions became muddled, but mistletoe remained an important winter symbol. It was often hung in doorways to deter demons and witches, and was widely thought of as a universal healer. The custom of kissing beneath it may have come from the belief that it stimulated fertility, or perhaps from an ancient Norse myth that resonated through the centuries. In the story, the beloved son of Frigg, the goddess of love and beauty, was killed by an arrow made from mistletoe. The gods all agreed that the plant should never hurt anyone again, but rather be dedicated to happiness and usefulness. Frigg’s tears became the white berries of mistletoe, and the goddess swore that she would kiss anyone who walked beneath it. No matter what the origin of the kissing custom is, American mistletoe makes a lovely winter decoration. Rather than an excuse to smooch, it’s a great opportunity to talk to guests about forest ecology and the fascinating biology and cultural history of this strange little parasite. Look up into the empty branches of oaks and sweetgums for a cheery clump of mistletoe this winter. It will likely be too high up to reach, but that’s a good thing; mistletoe is a valuable member of our forests and will do a lot of good up there in the treetops.